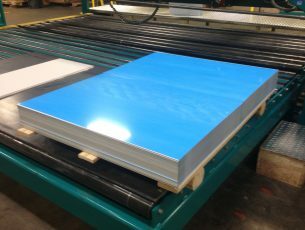 Sign Blanks | Wrisco Industries Inc.
WRISCO INDUSTRIES INC. can advance your Aluminum Sign Blank needs with our in-house computerized cut-to-length lines! Enjoy the highest quality aluminum sign blanks, the quickest turnaround on custom orders and the most competitive prices in today’s market. In addition, Wrisco recommends Prepainted White Polyester 24 Gauge Galvalume Steel Blanks. Have a request for specialty sheared blanks or odd length strips? Let Wrisco produce them for you. Need .024 x 6” x 12” Aluminum License Tag Blanks with prepunched slotted holes and corners, Wrisco is your source. Whatever your demands may be – digital printing, screen printing or vinyl applications, Wrisco can satisfy all your metal blanking substrate needs, both aluminum and steel! Large JIT Inventory of White Blanks in Standard Stock Sizes – Aluminum or Steel. Custom Size Blanking With Precision Cutting – Unmatched Quality. All Finishes, Colors and Gauges Available for Blanks. Complete Your Blank Project With Holes and Corners – Choose From Many Options. Punched Holes and Corners to your specifications, call for sizes. PVC Protective Masking – One Side, Both Sides or No Mask – Your Choice.